Well, I think all of the 2016 peony catalogs are out now. 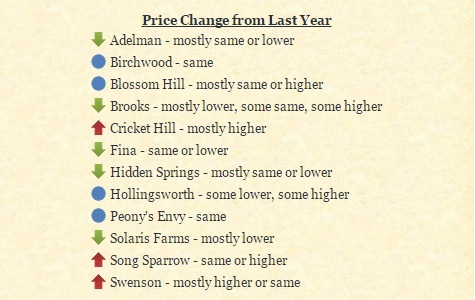 So I've updated my 2016 Intersectional Peony Catalog Price Comparison List. I decided to add a new feature this year to put green arrows for mostly lower prices, red arrows for mostly higher prices, and a blue dot for mostly same prices. Hopefully this will be a helpful feature when determining where to place your order. If you haven't taken a look yet to see what roots you'd like to order to plant this fall, now is a good time to do it. A few limited stock and in demand peonies have sold out already, but not many. However, the later you wait in the year, the more peony varieties will be sold out. So get your order in early!! !